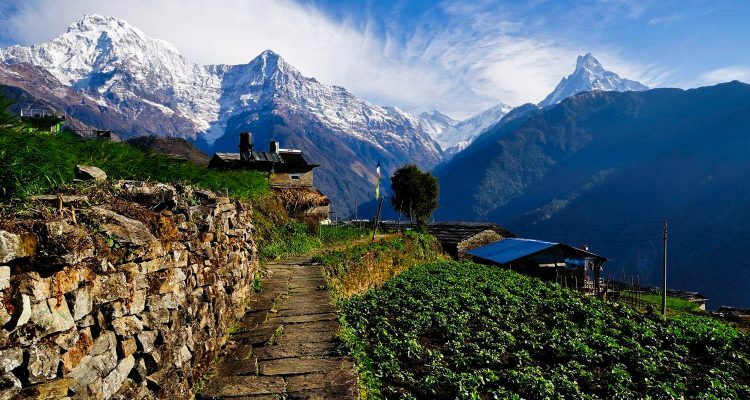 The Annapurna Sanctuary trek is in Nepal. We leave early in the morning from Kathmandu and make our way along river valleys, pass terraced fields to Pokhara which takes about 6-7 hours drive stay overnight in Pokhara. Early morning breakfast in Pokhara and drive to Nayapul by private cab/car or local bus takes 2 hours which covers nearly 46 km. Star trek to Tikhedhunga ascend slowly through terraced fields and classic mountain village stay overnight . Breakfast, and start steep uphill trek in the morning until Ulleri, and comparatively easy uphill trek to Ghorepani through delightful villages, beautiful dense rhododendron forest. If the weather is clear you will see stunning mountain views from Ghorepani stay overnight. From Dovan we will trek through intermittent bamboo forest. While climbing up to the trial one can have rest before climbing to Hindko(3139m), a short path to Deurali(3231m) and on through Bagar to reach Machhapuchhre Base Camp.